Tuesday, October 12, 2010 (yep…..we are still on the Cabot Trail): At one of the last overlooks in Cape Breton Highlands National Park we noticed folks were intently staring at the far hillside where there was a black bear was leisurely enjoying lunch in a berry patch. Using our binoculars we spent a few moments watching the cute critter which appeared to be an adult. The bear was too far away for me to get a photo but we enjoyed the experience anyway. Leaving the park we pulled into the French Canadian town of Cheticamp. A restaurant had been recommended to us by a long time citizen of the village we met earlier in the day. The Acadian Restaurant featured authentic French Acadian fare served by authentically costumed wait staff. It was obvious our fellow diners were from the area by the preponderance of French being spoken. We had an excellent meal of Fish Cakes followed by Butterscotch Pie. After the meal we took advantage of the attached museum to learn more of the area. Leaving the restaurant and walking back to the truck we enjoyed this beautiful sunset. Wednesday, October 13, 2010: Since it is Wednesday, please indulge me while I send a yell out to my OGBC homecronies who are at this moment probably sipping coffee at Brunswick, Maine’s Jen’s Diner and solving the problems of the world. Hey guys! Canadian currency is kinda like US currency and the exchange rate is pert near 1:1. 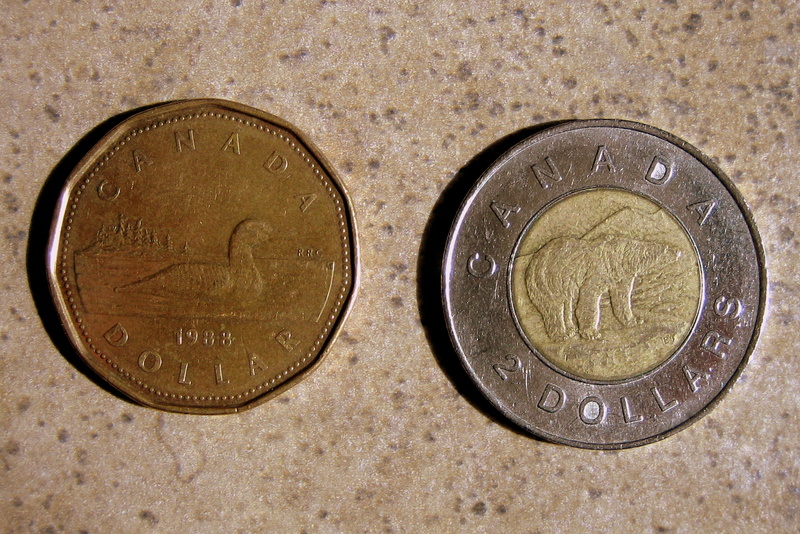 However their one dollar is actually a coin and they call it a “Loonie” because it has a loon embossed on the back. They also have a two dollar coin with a bear image on it but it’s not called a “Beary”…..it’s called a “Toonie”. Got that?!?! I was originally confronted with this jargon during the ill-fated “Great Laundry Disaster” of a few days ago. The owner of the campground, when asked about how the washers and dryers were operated, said; “You’ll need a few loonies”. I nodded and smiled…..and back away…..very slowly. The whole Loonie, Toonie thing seems a bit comical to me (pun intended). Today we decided to take a lazy morning and then head out in the early afternoon for a town called Mabou. The road we drove traveled through the interior of Cape Breton and passed small farming village’s nestled in pastoral valleys. The area reminded us both of Vermont. Arriving in the Mabou we walked the small downtown area and came upon The Gaelic Historical Society. Since there were lights on we decided to investigate only to discover we walked into a book launching and author reception. The host was very accommodating of our blunder and introduced us to the author and a few local dignitaries. We were surprised to discover when talking to the book author that he was a professor at the University of New Hampshire and lived in Kittery, Maine. The title of the book is “In the Blood” and is a historical perspective of the area. We traveled to this quaint little town to visit a place we had heard about back home. 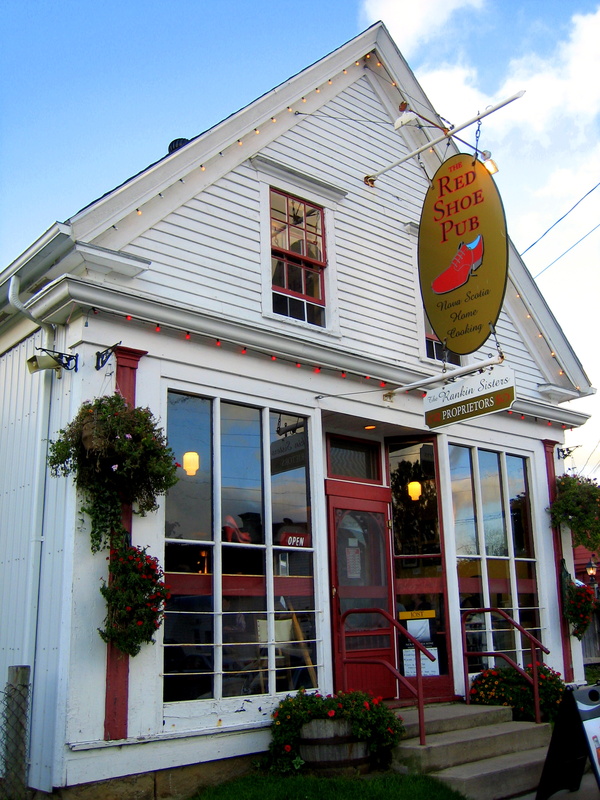 The Red Shoe Pub is an authentic village watering hole populated by local characters and features some interesting tavern fare. Since I needed to up my fiber for the day I ordered the house special which contained an abundant amount of barley, malt, hops and water. It tasted so good…..I had another. Kit decided on the fish chowder and for desert we shared warm gingerbread with rum butterscotch topping. It was the kind of place that you felt like just hanging out and visiting with the varied folks that wandered in. Thursday, October 14, 2010: This morning we head out. As I was having breakfast I noticed that the cereal box we had purchased locally had two front panels printed on opposite sides of the box, one in English and one in French. Then it dawned on me that this would be an easy way to learn French while sitting at the table having breakfast. So far my French vocabulary consists of the phrase: céréales de son raison. We hit the road at 1000 under sunny skies and seasonal temperatures taking the back road (surprise!) to Port Hastings which is the gateway to Cape Breton. We were soon on a dirt road and slowly made our way up and over Marble Mountain where the path turned to pavement again. 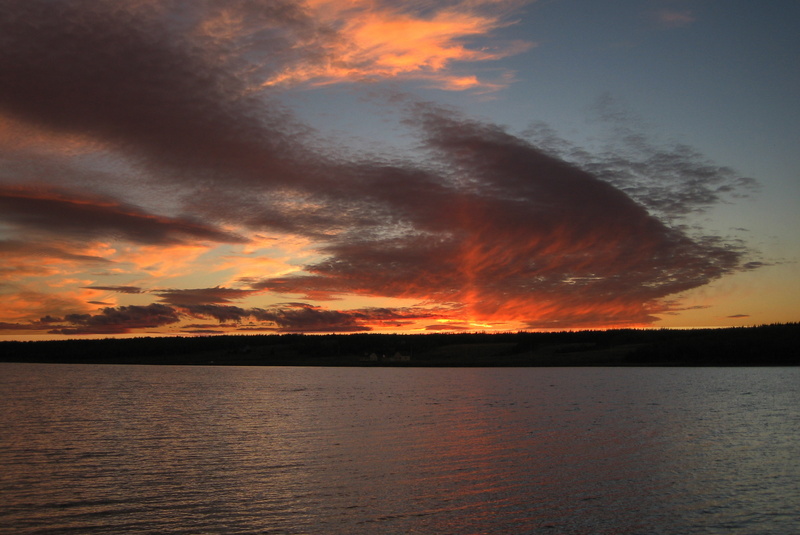 Soon we were skirting the Bras d’Or Lake and came to this view. Following the road down to the little village of Dundee we came upon some neat old wooden boats that were in remarkable shape and appeared to be used regularly. This one was pulled right up to the owners shore side home. In Port Hastings we pulled into a parking area near the Canso Causeway where we took a break for lunch. 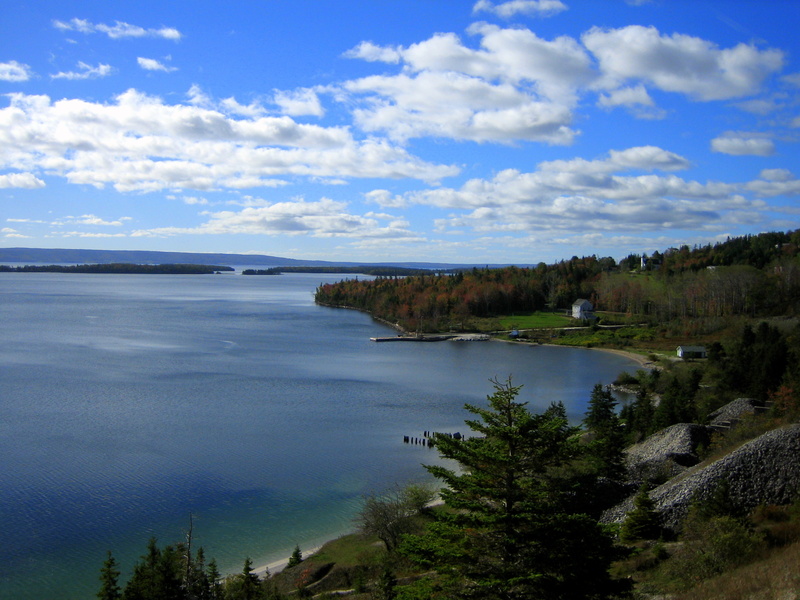 Cape Breton is an island that is separated from the rest of Nova Scotia by the Strait of Cansco which connects the Atlantic Ocean to the Gulf of Saint Lawrence. 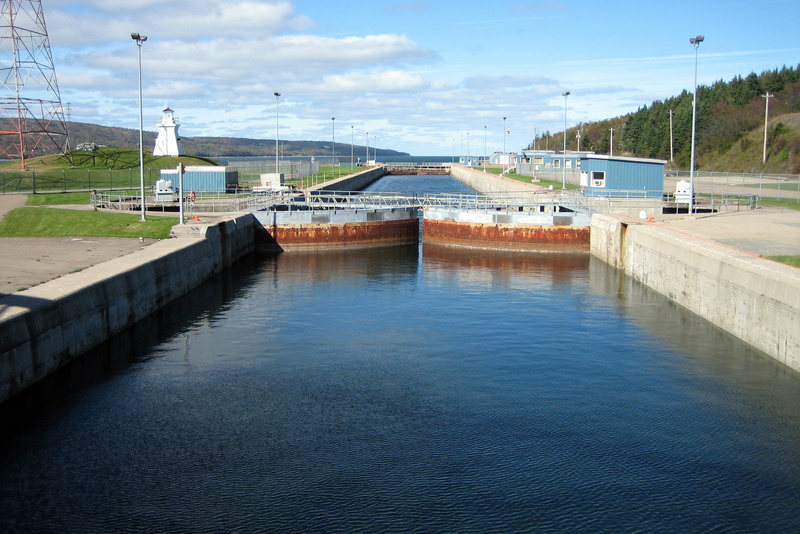 It is artificially connected to the mainland of Nova Scotia by the 4,544 foot Canso Causeway. In order to accommodate ship traffic, a canal was built bisecting the causeway. However the tidal currents are so strong that a series of locks had to be designed and built to allow ships to navigate against the flow. Back on “The Mainland” of Nova Scotia, which is actually an island as well, we decided to make better time by utilizing TCH-104. At one of our gas and comfort station stops Kit discovered a “plumbing problem” with the trailers facilities. Not sure what was going on we decided to lay over in the town of Antigonish and stay at Whiddens Campground which is the nice campground we stayed during our transit north. After setting up the camper for the night I began pulling out the tool box and my assortment of repair parts. Kit decided to help by bringing me a 12 inch stick she had found laying on the ground. I gently asked her if she would rather walk the short distance into town and do some shopping while I investigated this casualty and formulated a plan for its repair. Well…..after futzing around with various tools and implements I decided a stick might just do the trick after all. It worked…..please don’t breathe a word of this to Kit. My pride and manhood are at stake. Friday, October 15, 2010: With a fully functioning trailer we hit the road at 1030 under cloudy skies. Stopping for fuel and to fill a depleted propane tank we continued on TCH-104 toward New Brunswick. While pulling off the highway to find a spot to stop for a break I noticed a large tour bus disgorging folks about our age into a large complex called Masstown Market. So we sidled up next to the bus and went in for a look see. After 90 minutes we left with full stomachs and heavy shopping bags…..I’ll let Kit describe the place as she explored every square inch. Kit: This place turned out to be a goldmine! Since we were hungry when we went in the door, we quickly discovered the business contained a cafeteria style restaurant. Since all the “blue hairs” from the bus were eating there, we decided to have lunch, as well. Next was a tour through the gift shop. Lots of nice stuff to look at but we didn’t buy anything. Next was the grocery store. In addition to all the standard things, dairy, pasta, soup, etc. they had the very best selection of produce I have ever seen. And to cap it all off there was an incredible bakery featuring fresh from the oven breads, rolls and desserts. We bought a few items to augment our provisions then continued our trek along TCH-104 towards Maine. Crossed over into New Brunswick at 1430 in a steady rain and increasing winds. We thought about finding shelter but we were both alert and anxious to get back to the states so we motored on while listening to the Canadian Broadcasting Network. The wind gusts were strong and had an adverse effect on the truck and trailer. We slowed our speed in order to better manage the buffeting and ensure safe traveling. At 1900 we crossed the border into Houlton, Maine and regained that hour we lost a few weeks back. It was raining hard, the skies and streets were dark and we were getting tired. As we neared the campground we had selected there was a sign that said Closed for the Season. Drat! Heading further south on I-95 we hoped that the only other campground in these parts that was listed to be open actually would be. After getting lost in the dark and then having to back out of a driveway into the main road we finally arrived at Birch Point Campground located on Pleasant Lake in the town of Island Falls. This was one long day! Kit’s Corner: Good thing I had a phone number for an additional campground. I called and fortunately, they had space for us. Turns out, we were the only campers there! And, we had stayed in this campground before, about 25 years ago! Who knew we would ever make it back there!!!! 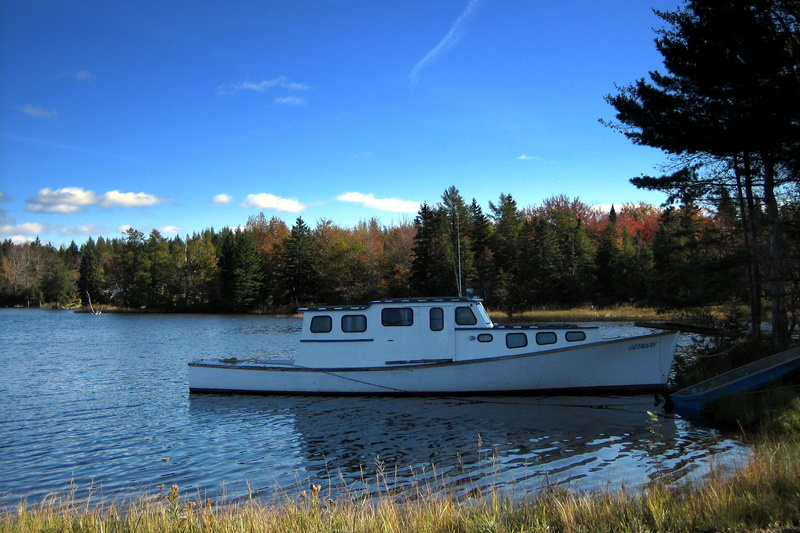 The next few days we explore “The County” and Eastern Maine…..Stay tuned. This entry was posted in 2010 Fall Vacation. Bookmark the permalink. Wow! Nova Scotia is beautiful. We were in Yarmouth many years ago – but you have given us extraordinary sites. You sure know how to pick the scenic spots! All your descriptions of local food leaves me drooling! Thank you for sharing insite to our northerly neighbors! Sure is inviting! We spent a night in Cheticamp a few years ago, but it was pre-motorhome and we stayed at a bed and breakfast owned by 2 women (neither of whom spoke English). They had a young girl to help with the cooking and she spoke English. We walked around town…it was quaint and very quiet. Pretty. Are you home yet? We are leaving Monday for the south. Kit, do you want Tara Road back (Maeve Binchy) or do you want it passed on?